What's wonderful about being of the female gender these days (and really for at least the last 40 years) is that it’s okay to be whatever you want to be. Truly, there are no professional or social limitations on whatever you choose to do, at least not in America. You can be a career professional, a stay-at-home mom, a politician, a lady of leisure (it helps to be independently wealthy), a volunteer for charitable causes, a homemaker/ gardener/chef/Martha Stewart want-to-be, etc., and by any standard of measure, any option you choose is okay. Each is respected and quite acceptable across all segments of our society. The same goes for gals in the outdoors. We can have as much or as little involvement in it as we want and whatever we choose is okay. But in my opinion, more is better especially after seeing all the fun the guys have been having for 22+ years at Joshua Creek Ranch where there’s wingshooting, sporting clays, fly fishing, and deer and turkey hunting. For more than just my own business reasons, I’m an advocate of women getting more involved in the outdoors, especially the sporting life. Women deserve to enjoy the exhilaration and gratification of breaking that target and bagging that bird and hooking that fish…and they possess all the natural instincts to quickly develop the skills to be successful at it. But I want to regress a moment to the idea that whatever level of involvement we ladies want is okay. We may just want to walk along on the upland hunt, watching the dogs work and applauding the shooter who bags a double; or lounge in the shade observing the quiet concentration of the fly fisherman casting his line to the trout held up behind a boulder; or keep score for the sporting clays shooters competing for who’ll buy the beer at the end of the round. Just to be out there observing/absorbing/adoring the great outdoors at any level of participation is rewarding. The level of comfort we have participating in sporting activities really depends on how much opportunity we’ve had to practice. Like swimming or riding a bike, it helps to start when you’re young so it’s practically automatic as an adult. But whenever you start, some expert coaching along the way and plenty of practice can bring those skills to a very high level. BUT it’s okay for us gals to settle for a mediocre skill set and measure our success in fun. We’ll always be welcome with an “acceptable” level of competence so long as we bring along a good sporting attitude. Besides, ladies, you may not want to outperform the host who invited you. It could put future invitations in jeopardy, especially if that host is your boyfriend or husband. 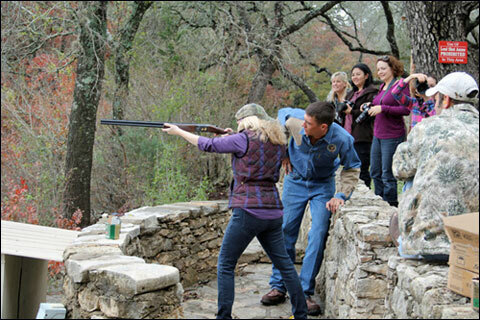 One of the lady food bloggers tries her hand at sporting clays at Joshua Creek Ranch. Just recently we had the perfect group of ladies demonstrating “FUN” as the prevailing factor in the outdoors when a group of lady food bloggers was brought together at Joshua Creek Ranch by huntress and chef, Georgia Pellegrini. The purpose of the weekend was to introduce these guests to wild game cooking, with a sideline course in shotgun shooting and fly fishing. Most of the gals had never shot a shotgun and many had never been on a ranch. You’ve never seen such whimsy and delight among a group of highly skilled professional women. The best part was their footwear of choice on a Texas hunting ranch. Follow this link to see the stories they wrote and the phenomenal photos they took: www.joshuacreek.com/about/news-media/news. In April another group of ladies will come for a retreat called Casting for Recovery. Their outdoor experience at the Ranch will be to teach them to fly fish. 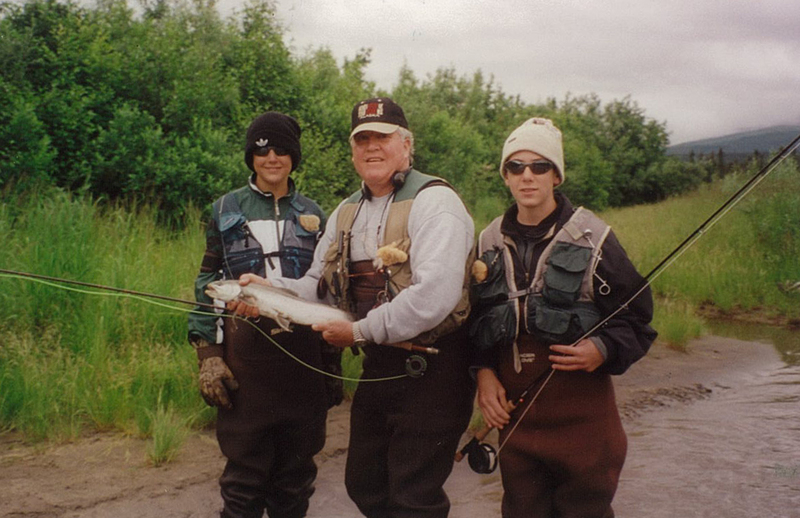 But while they’re here, volunteers skilled in much more than fly fishing will lead them through sessions aimed at fostering their recovery, restoration, and resolution as they journey through their experience with breast cancer. 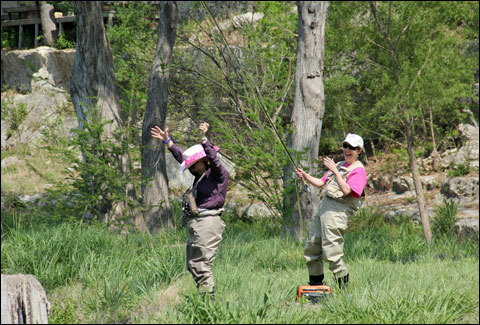 Women experience the joy of fishing at the Casting for Recovery breast-cancer retreat at Joshua Creek Ranch. The opportunities to enjoy something in the outdoors are as vast as the outdoors themselves. The important thing is not so much what you’re doing or how well you’re doing it, but that you’re sharing the experience and creating memories with people who are important in your life. So get out there this spring and summer and have some fun. March 1, 2012 is the beginning of the final month of the upland bird hunting season at Joshua Creek Ranch (JCR). In my mind, I picture the calendar as twelve monthly segments arranged in a circle. October through March segments appear smaller than the other months, and if my circular calendar were placed over the face of a clock, those six months of October through March would be all jammed up between 10 o’clock and 2 o’clock. That’s how fast the hunting season seems to go compared to the rest of the year. The other day I received a call at my Joshua Creek Ranch office from the wife of a wingshooting client. She asked if I remembered a newsletter we’d sent out several years ago that had a piece in it comparing the benefits of men having dogs rather than wives. She was in hopes of getting a copy of it to share with friends. I did vaguely remember it, but to tell the truth, searching for that particular newsletter rated about minus two on my scale of things I needed to do at this particularly busy time of the hunting season. My husband Joe and I just finished a delightful late lunch at the top of Aspen Mountain in Colorado with our good friends Toby and Liz from Cincinnati, Ohio. We had met them in Scotland several years ago when we went on a driven pheasant shooting trip in the beautiful Port Patrick area. Yesterday was Thanksgiving Day and we had the traditional gathering of family and friends to celebrate and give thanks for our many blessings, starting with this great country and ending with the vivacious young grandchildren buzzing about the house and lawn. But one of our blessings was missing this year. For the first time in 27 years, our oldest son wasn’t home for Thanksgiving and a much loved tradition of our family hunting together over this particular holiday was broken. It set me to thinking about the heart-warming anticipation of traditional gatherings we’ve established over the years, the shooting and fishing activities we’ve inevitably incorporated into them, and the many fond memories we’ve made year upon year. The month of November strikes panic into the mind of this Shotgun Wife since it marks my last chance at planning and orchestrating a holiday season that might possibly be as relaxing and enjoyable for me as for my family and our guests. If I started right away, and devoted these next several weeks to conscientious organization and anticipation of the details of menus, decorations, entertaining, gift selections, etc., I could actually envision myself casually whistling “Deck the Halls” into a delightfully laid-back holiday season. I’m a Texan so, of course, I’m tuned in to what’s going on in our great state. But wherever you reside, you’d have to be living in total isolation not to have heard about the catastrophic drought, heat and wildfires that have plagued Texas all summer long. 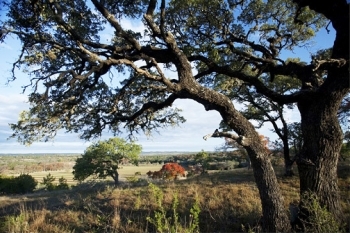 Truth is, for us it started a year ago in September 2010, when Mother Nature turned off the rain faucet in our beautiful Texas Hill Country after lavishing us with abundant and timely showers throughout the prior summer. Since then, our average annual rainfall of 30 inches has shrunk to a meager 20% of that amount, a total of 6 inches in a whole year. Spring-fed creeks are bone dry and rivers are a trickle. Parched landscape holds its breath for fear of wind-driven wildfires, and residents sweat out record-breaking high temperatures. Many of us remember our parents and grandparents reciting stories about the drought of the 1950’s, but the summer of 2011 will likely prove to rival those days. Having dogs around all the time is just part of my day-to-day life as a hunting lodge operator and wife of a wingshooting enthusiast. They’re everywhere...in my house, my yard, my office, around the lodge, at the ranch kennels, in the hunting guides’ trucks and dog trailers, in the hunting fields and pastures. I mean, literally everywhere. I think we’ve either owned or hosted every imaginable breed of bird dog at Joshua Creek Ranch at one time or another over the past 22 years, including some deaf dogs, three-legged dogs, half-blind dogs, and old arthritic dogs who wouldn't give up hunting any more than their deaf, half-blind, old, arthritic masters. And I love having all those dogs around....IF they’re well trained and have nice manners. It's late morning on a Saturday in mid-July at Joshua Creek Ranch and seems unusually still and quiet after being abuzz day and night for the past week with high-energy active teenage guests. The JCR staff performs post-guest clean-up dutifully, but with the help of some extra young people. All are anxious to be done with their work and on with enjoying some time off after a very intense week of managing the busy itinerary of the group that just departed. What's been going on the prior week has become one of my favorite activities at the ranch...the Youth Outdoor Adventure Program (YOAP).